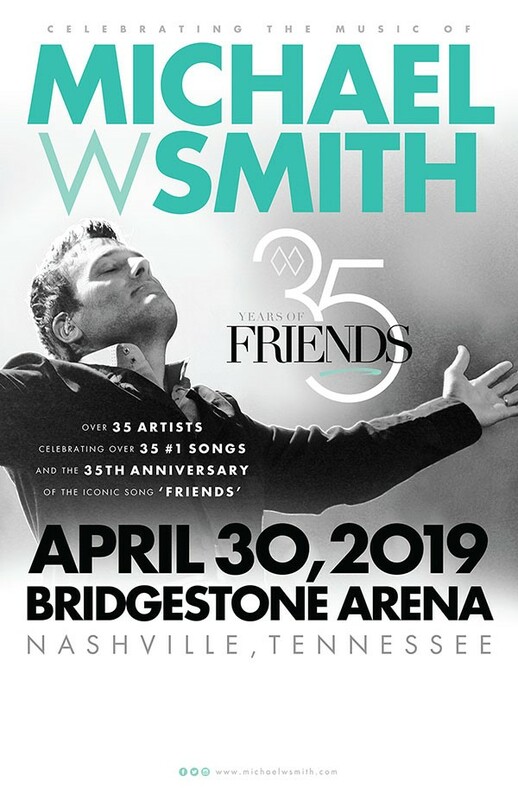 Rascal Flatts, Point of Grace, Phil Keaggy, Henry Cho, Nate Bargatze and John Crist Added To Star-Studded Tribute Concert ’35 Years Of Friends: Celebrating The Music Of Michael W. Smith’ April 30 in Nashville | 2911 Enterprises, Inc.
Michael W. Smith has been releasing new music regularly and performing around the world to sold-out crowds for the last 30+ years. During his storied career, he’s written over 30 #1 songs, been honored with three GRAMMY® Awards and 45 Dove Awards, one American Music Award, was inducted into the Gospel Music Hall of Fame and has sold more than 15 million albums. His most recent USA Today, Yahoo! Music and Billboard-acclaimed studio album A Million Lights and Parade, Good Morning America-featured and GRAMMY nominated live worship album Surrounded have together become his 30th and 31st Top 10 hits on Billboard’s Top Christian Albums chart, more than any other solo artist in history. He’s also given back to the global community. Smith has raised funds to battle AIDS in Africa; started Rocketown, a safe haven for young people in Tennessee to meet and find hope; and has helped more than 70,000 children through Compassion International. He has also written several bestselling books, including Old Enough To Know and Friends Are Friends Forever. For more information, visit www.michaelwsmith.com.